This is a kit that I bought a while ago simply because I loved the look of it and thought that it would make a welcome change of pace from my usual vehicle models. 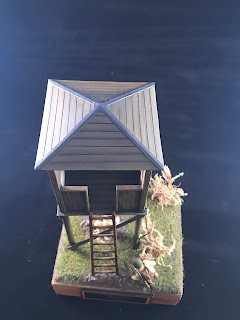 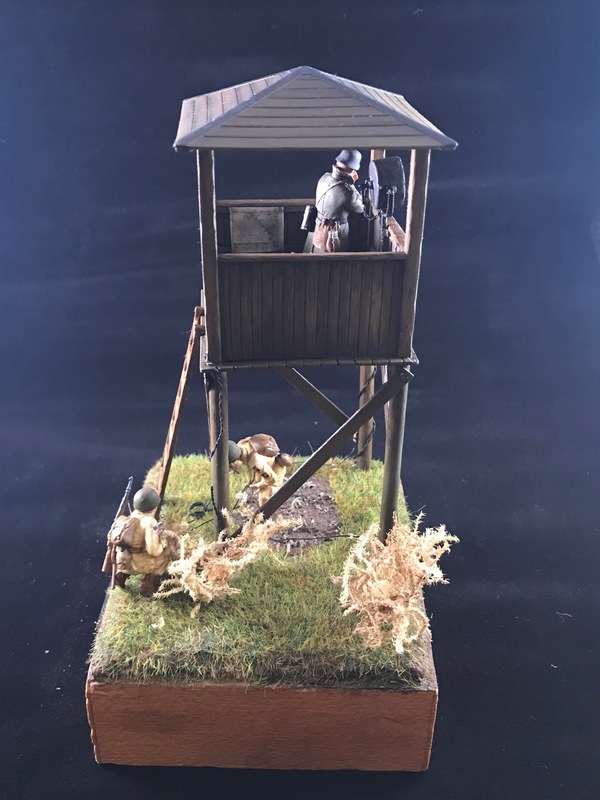 The kit is a simple watch tower and four very good figures which can be used as part of the small dio in a box provided by Masterbox. 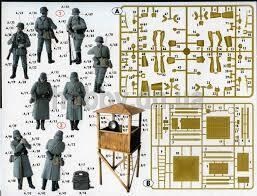 The quality of the kit is good and the build is extremely easy. 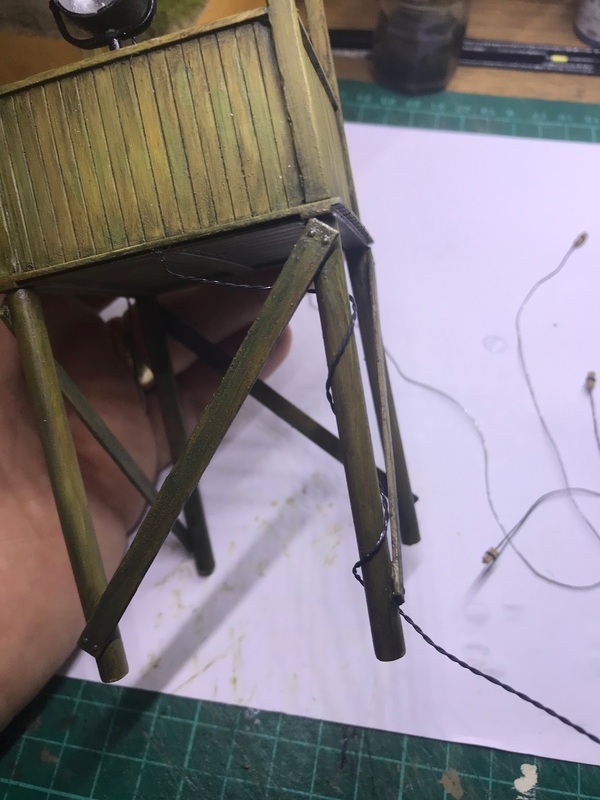 I would point out however that the locating holes for the legs of the tower are all but non-existent on the legs and I had to drill and add some rod to provide a good location to glue everything together. 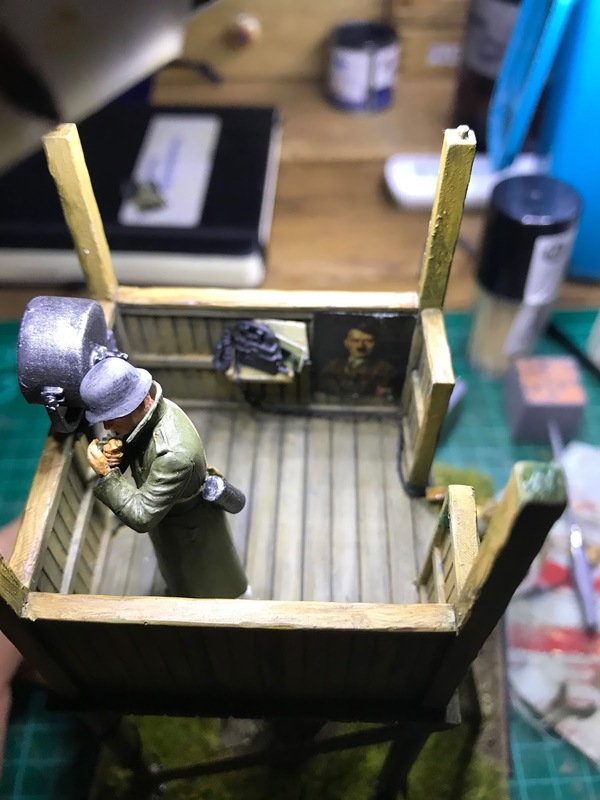 There was also a large amount of sink marks on some of the pieces that was easily filled using some squadron white filler. 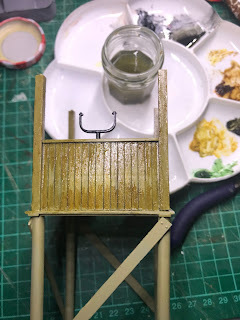 Everything was assembled save for the roof which I will place on at the end. 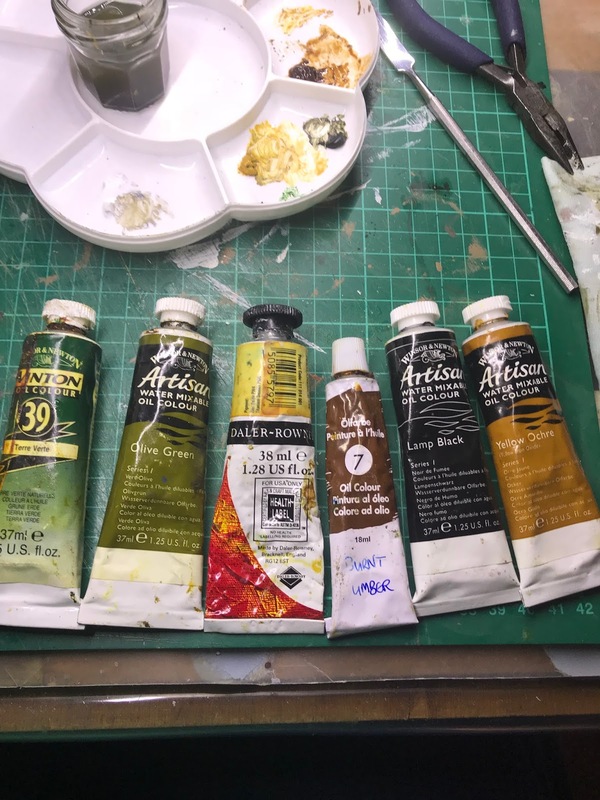 This should make painting and finishing a whole lot easier in the long run. I was also disappointed to find that although a searchlight is provided in the kit; a clear glass section is not supplied ! its not a huge problem as this can be scratch built quite easily, but I would have thought that this is something that should be supplied especially when you consider that Masterbox is gaining an extremely good reputation for quality kits? The photos above show the tower assembled and ready to paint. 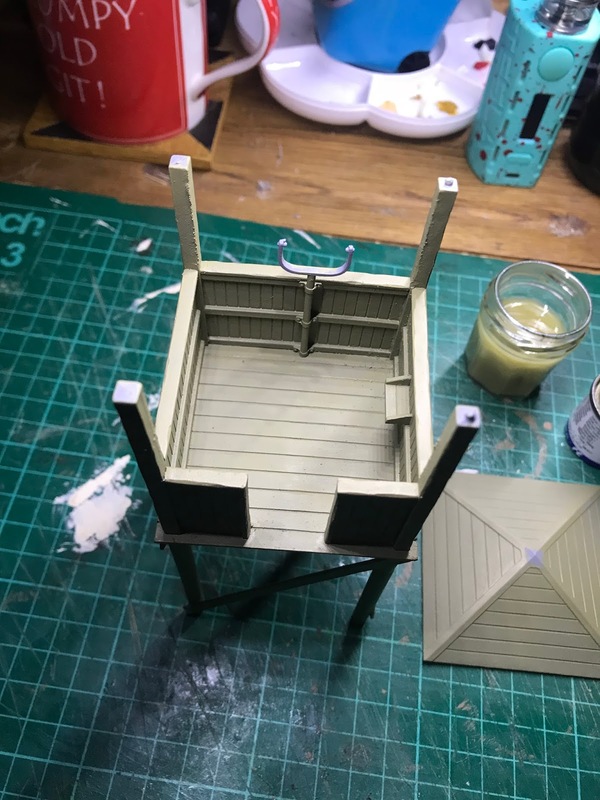 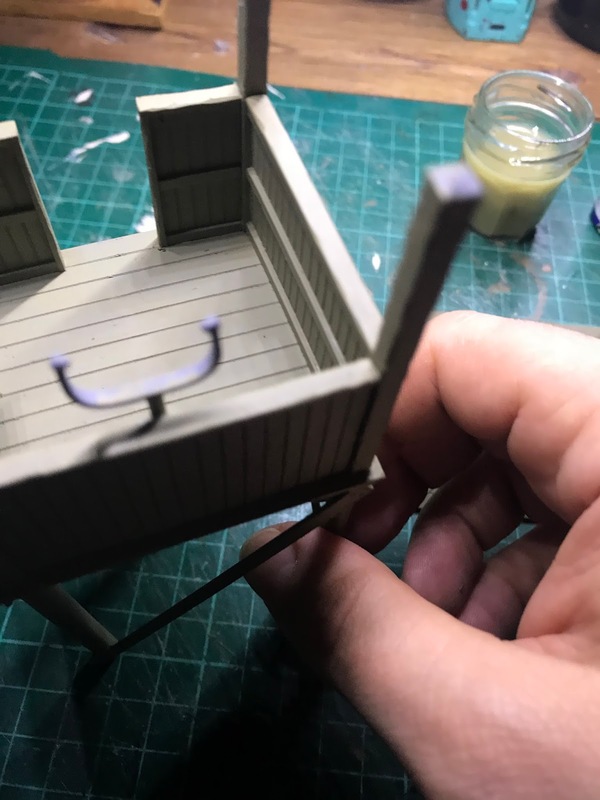 The whole of the tower was then roughly filed using watchmakers files and course grade sandpaper in the direction of the planks as Masterbox did not provide any wood grain detail at all for the tower. 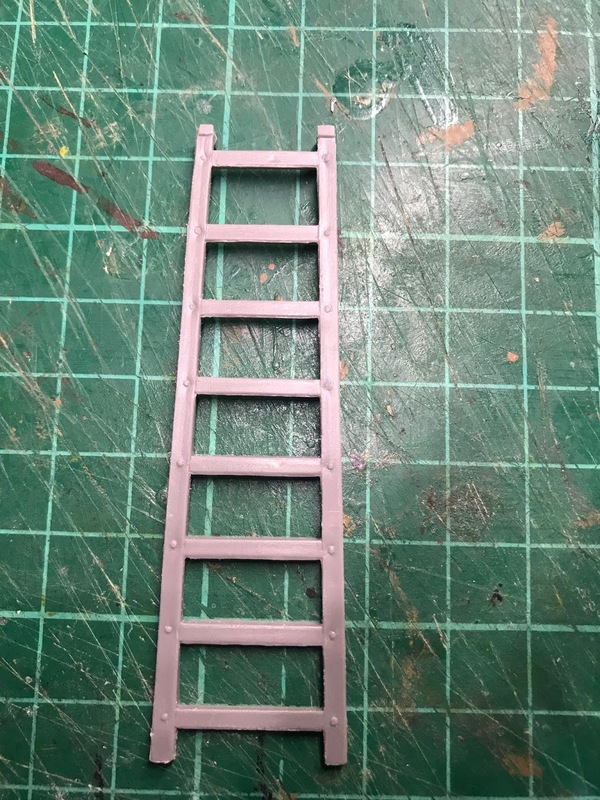 I also used a very sharp knife to remove the clean edges from the uprights and the handrail. 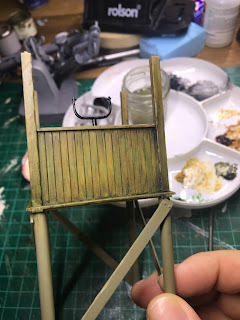 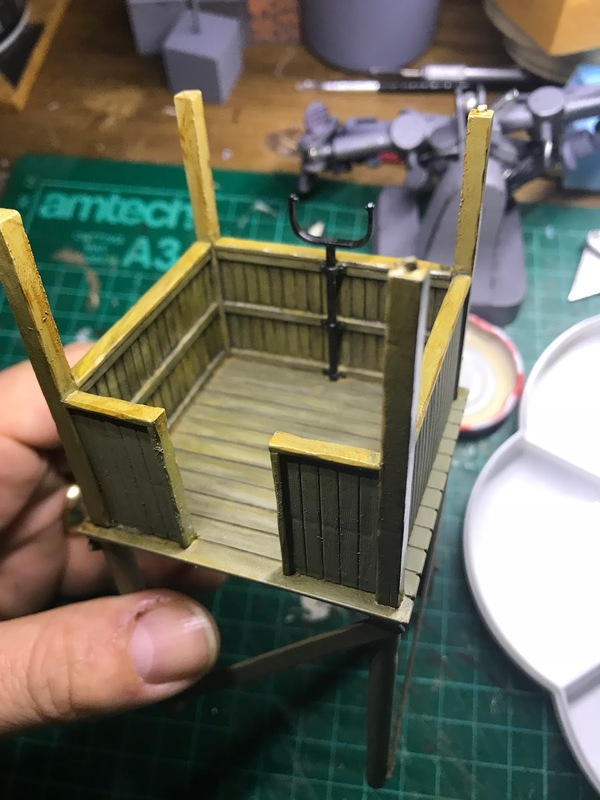 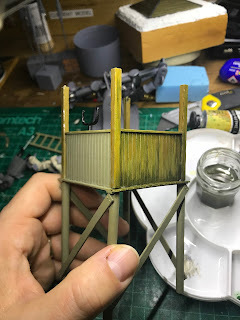 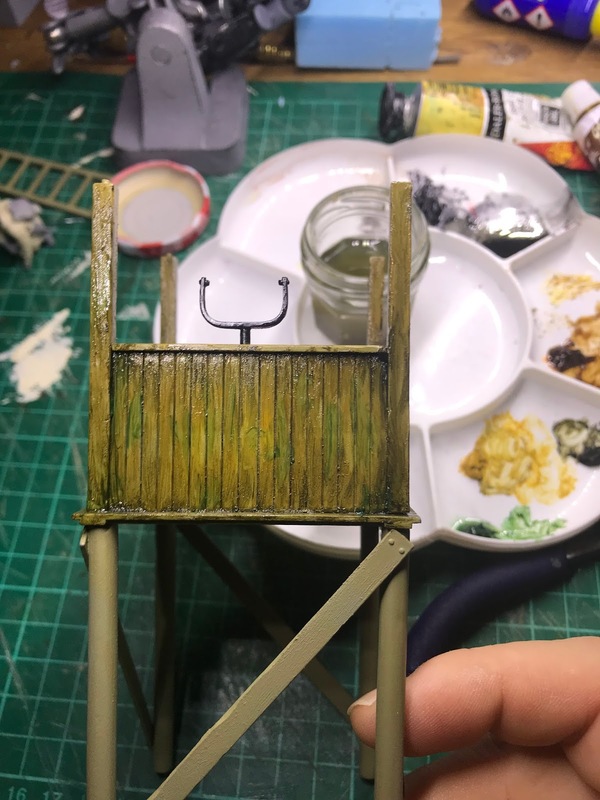 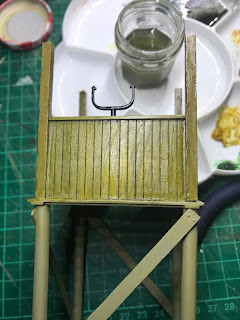 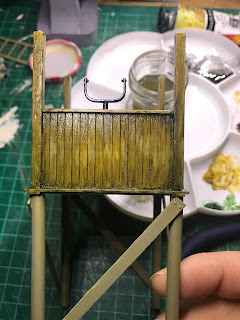 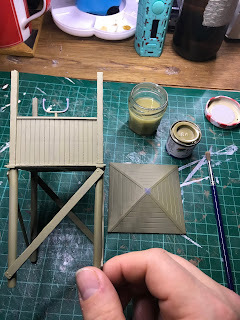 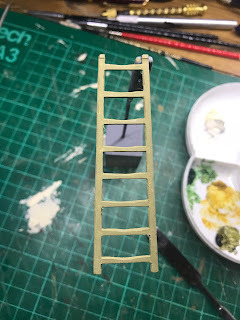 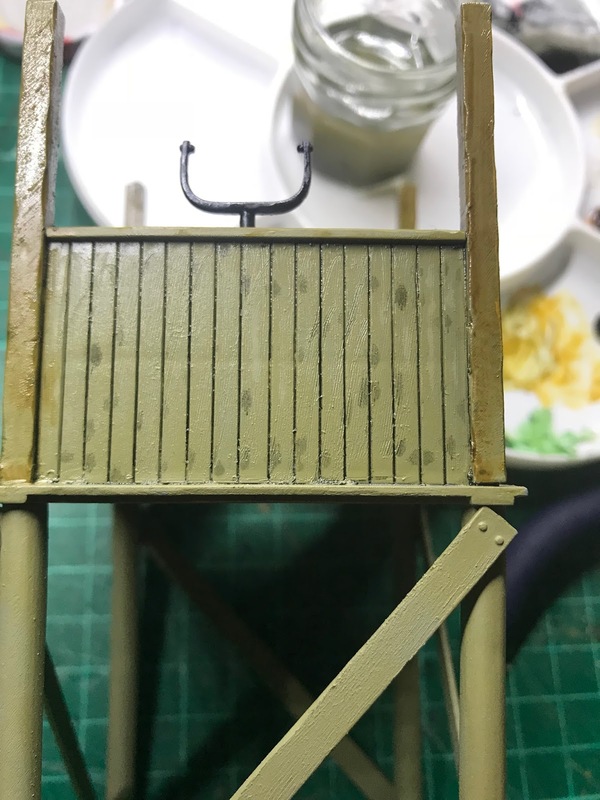 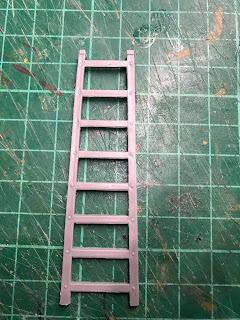 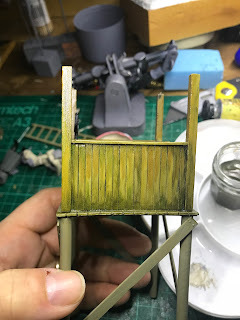 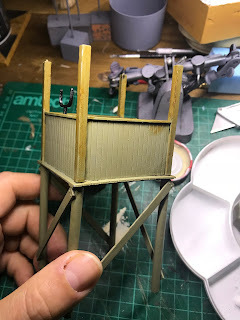 Once I was satisfied the the "rougher" look that I thought was deserving of the tower, the whole thing was sprayed in grey primer and then a coat of humbrol light brown was applied and allowed to cure fully. 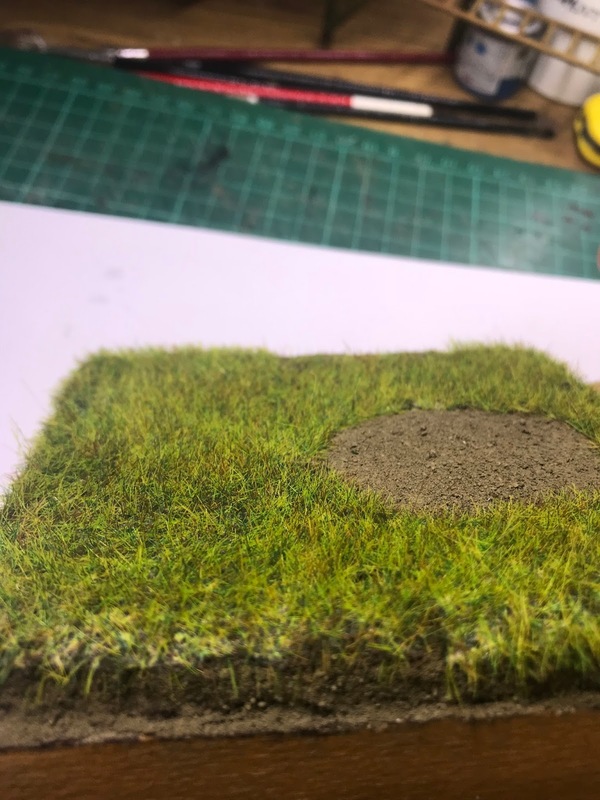 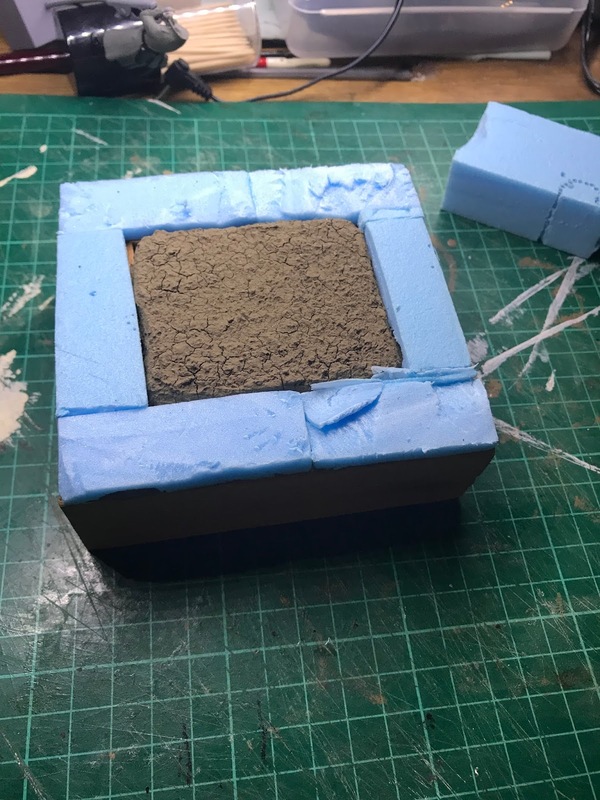 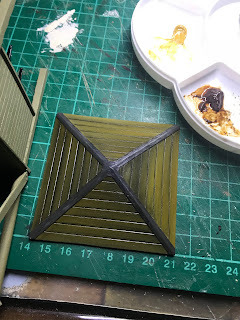 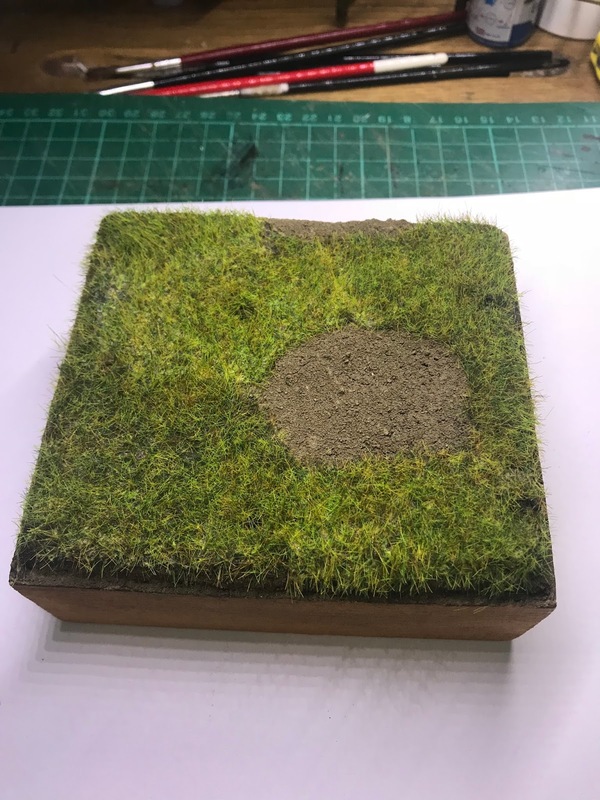 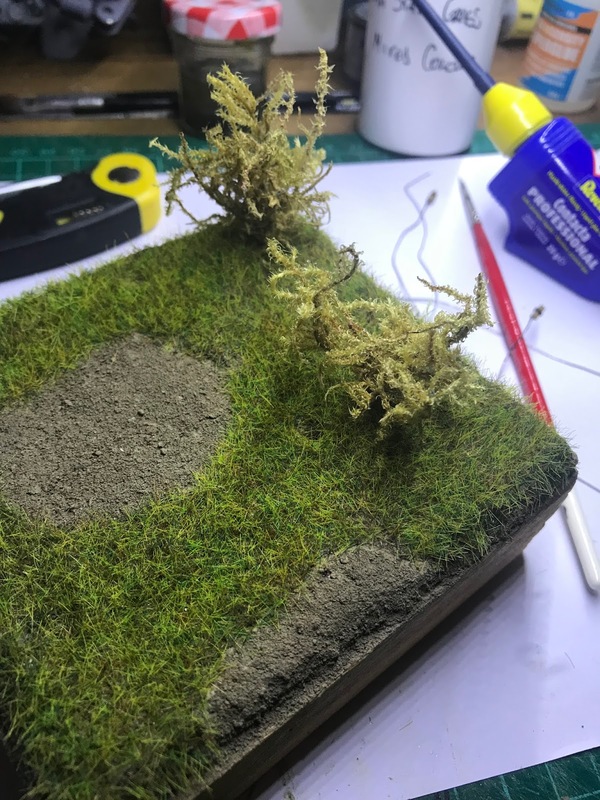 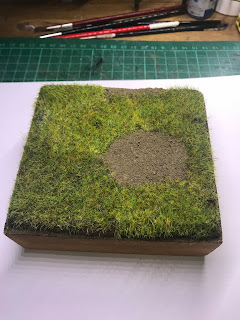 As I have previously mentioned; I wanted to make this a relatively small scene in terms of its footprint so after a quick rummage around I found an old base that I had began to make for another model but decided against using it. 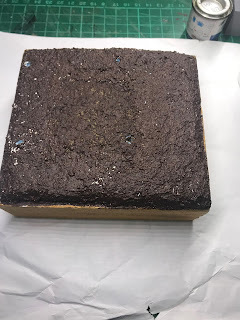 I added some more blue foam to increase the size of the groundwork and then coated the whole thing in some artists coarse medium as a good starting point. 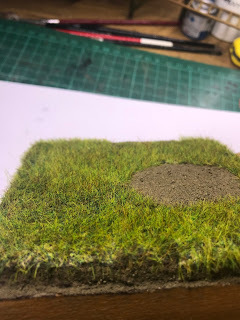 once the medium had dried I then gave the whole ground work a coat of acrylic brown and then used powdered earth to give it a realistic look. I would point out that I am very fortunate to work in a university that has a civil engineering dept. 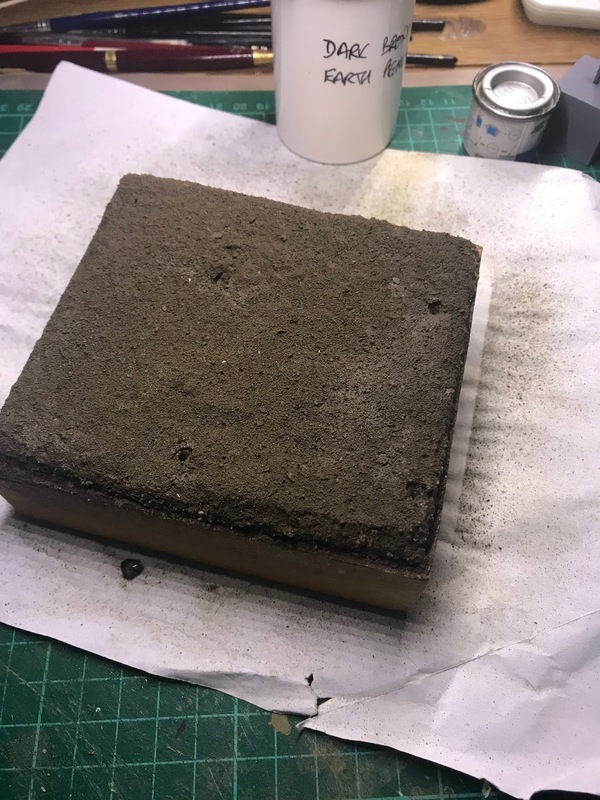 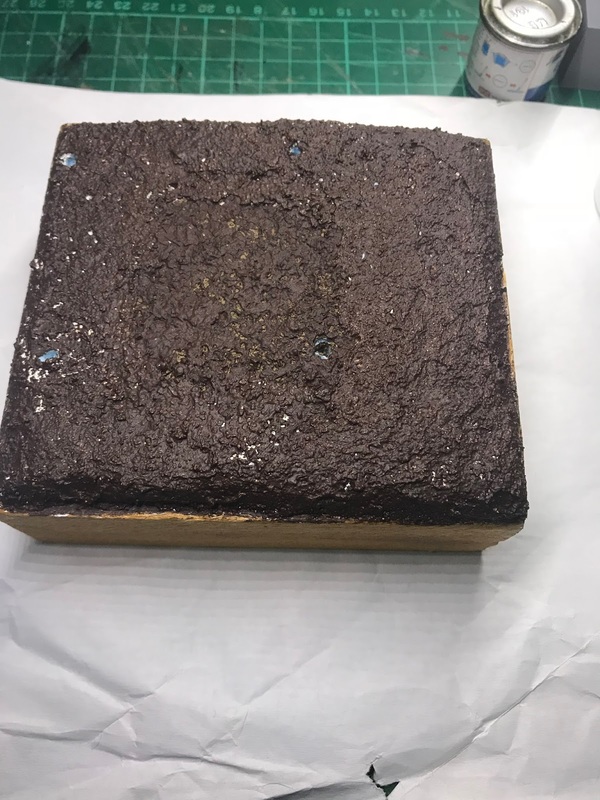 This means that they take samples of earth from various locations around the country that is then dried and powdered for various experiments. 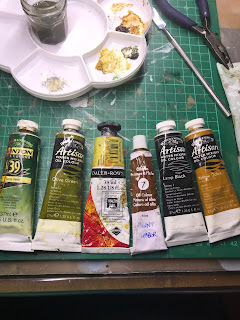 Once used they throw it away but not before the technician comes to see me to see if I would like some!! 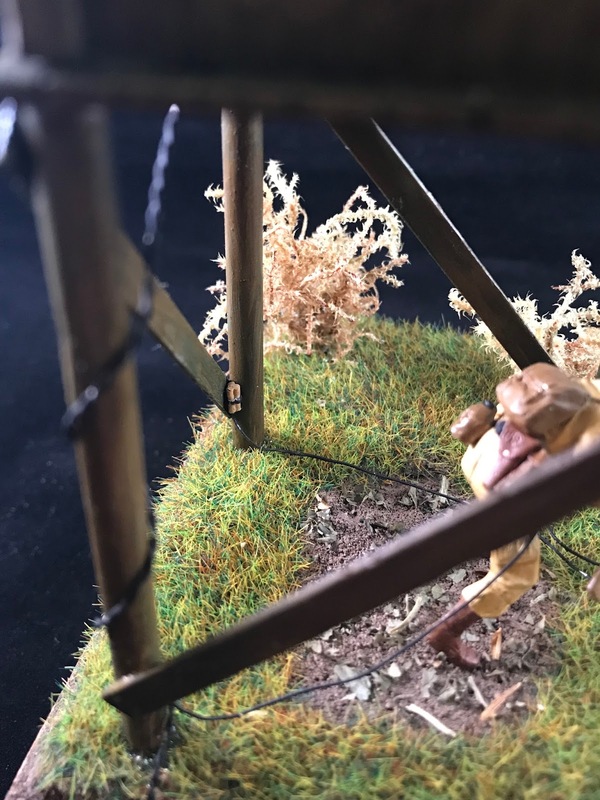 This was an important choice as these would effectively show the "theme" of the scene. 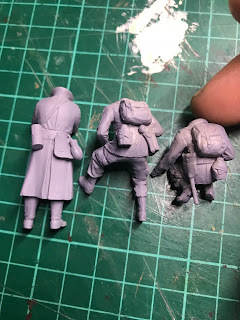 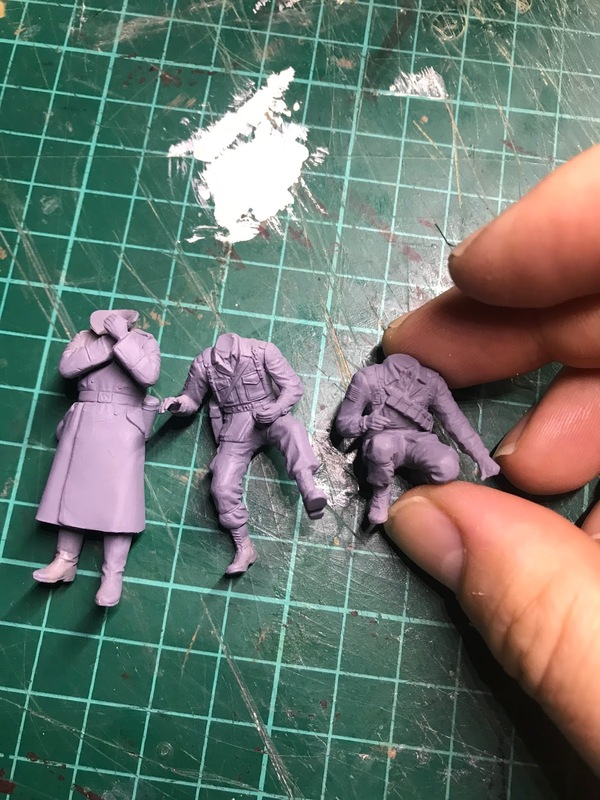 I opted to use one of the figures provided with the watch tower kit and two American figures from a different kit that I had as spares. 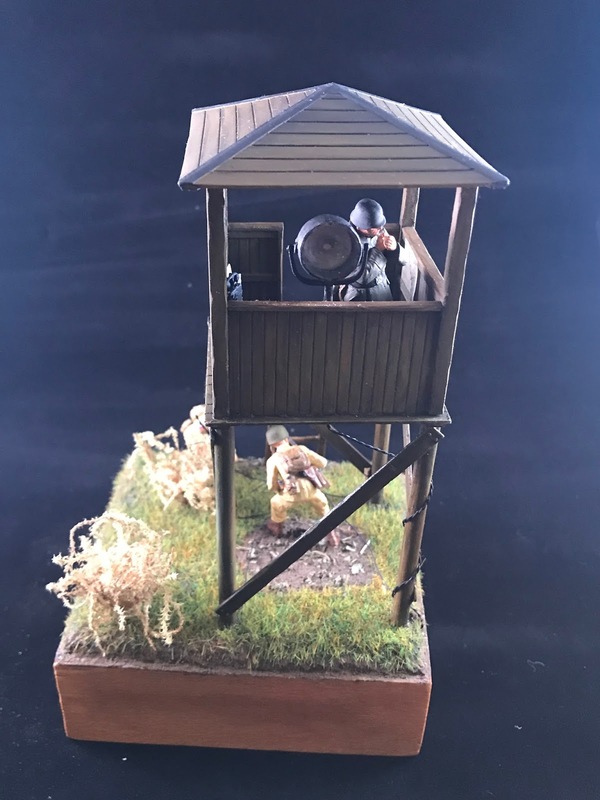 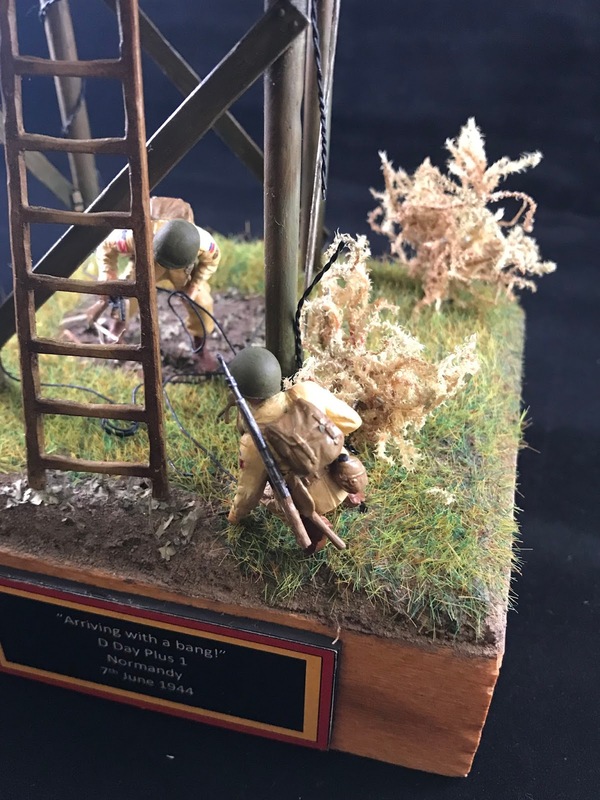 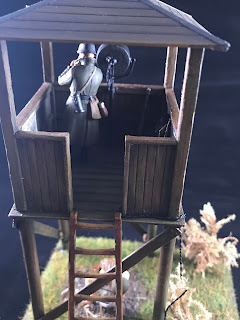 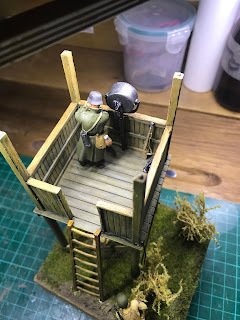 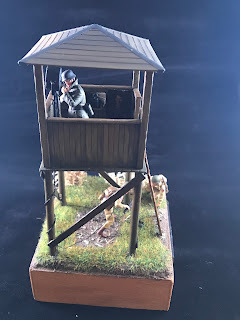 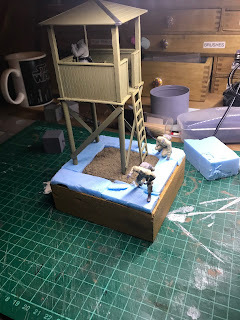 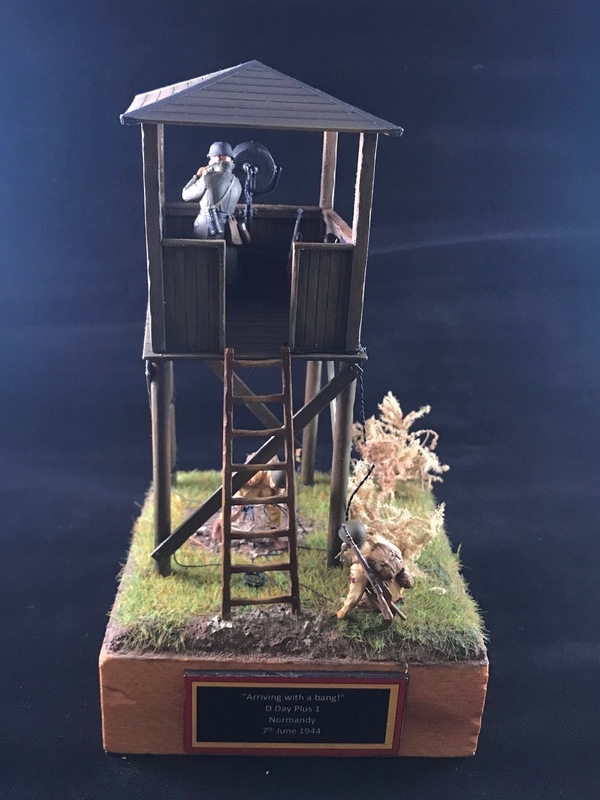 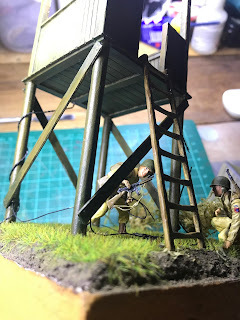 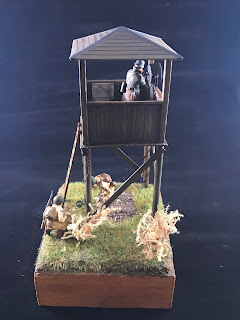 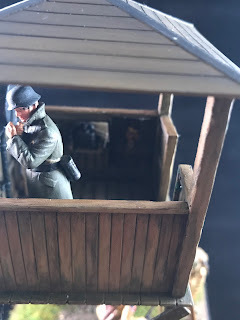 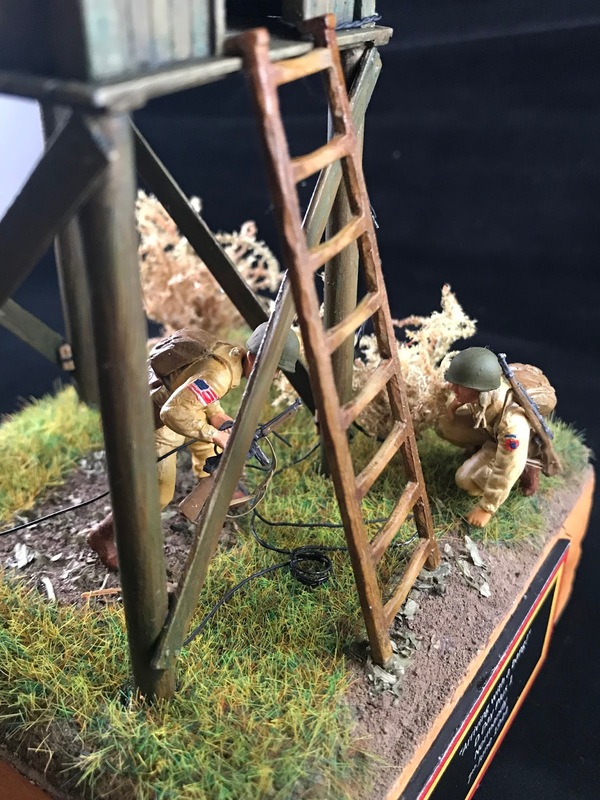 The story of this diorama is that of two paras rigging the feet of the watchtower with explosives that would destroy the tower and probably kill the poor guard above who is lighting his cigarette. 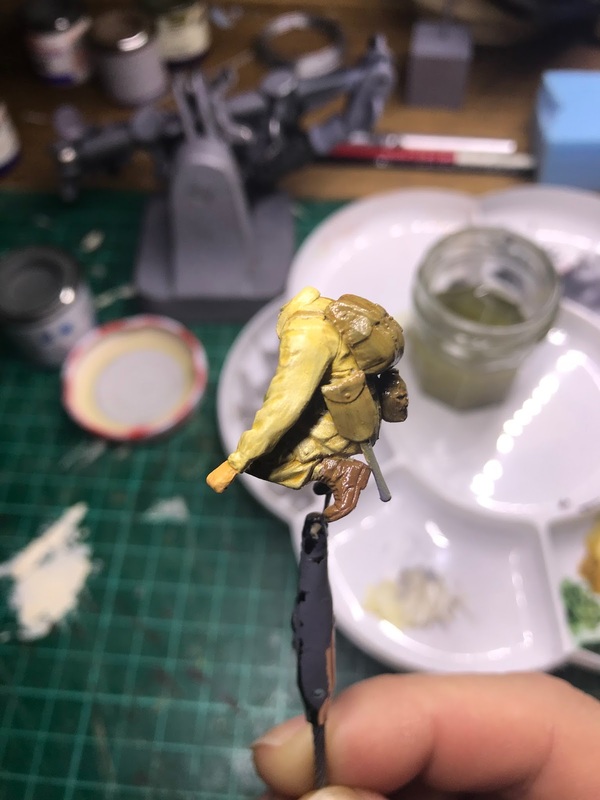 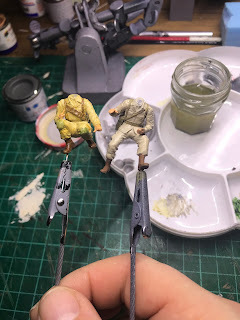 All of the figures where given a coat of grey primer before a base coat of Humbrol colours and then oils were applied to bring depth and light to them. 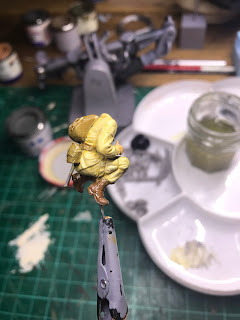 The final build is something that I always enjoy. Its the realization of the idea that I had for the project at the start. The first stages were to complete the interior of the watch tower by adding the telephone and then the cables for it along with the cables for the spot light, next the figure was added and this was later followed with some prints of newspapers, magazines, a map and of course a pictuer of Hitler in the corner! 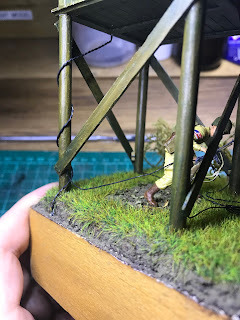 Some bushes were made for added interest on the base and then the sticks of dynamite glued to each leg joint. 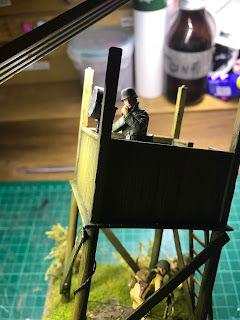 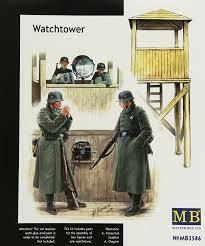 Once I was happy with the layout the watchtower was glued to the base and the American para's were fixed in place. 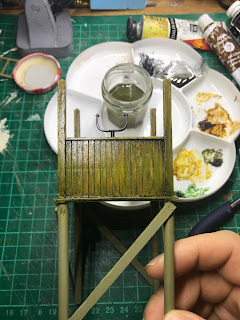 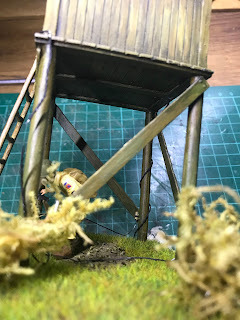 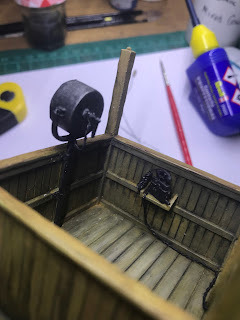 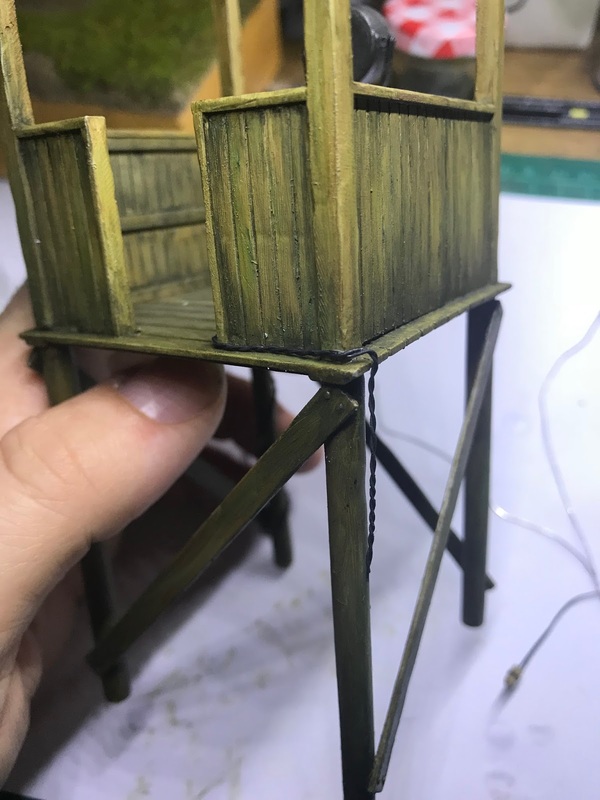 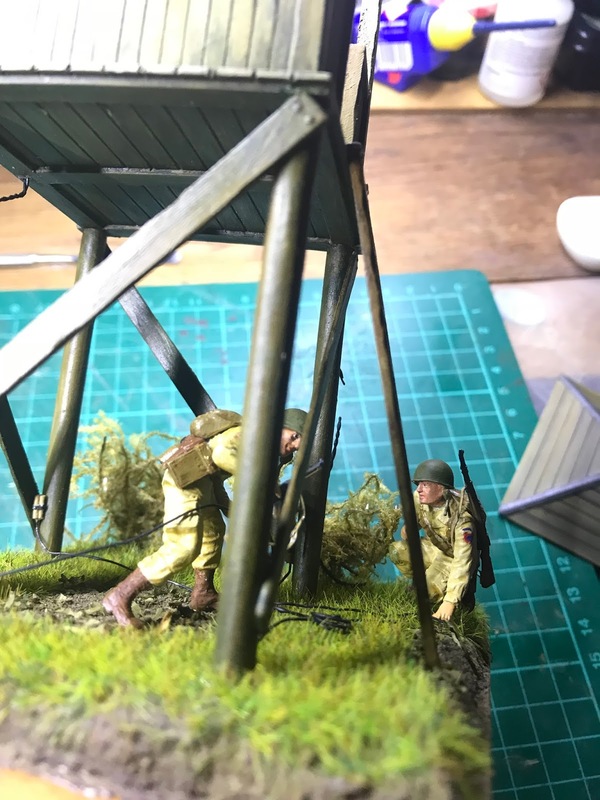 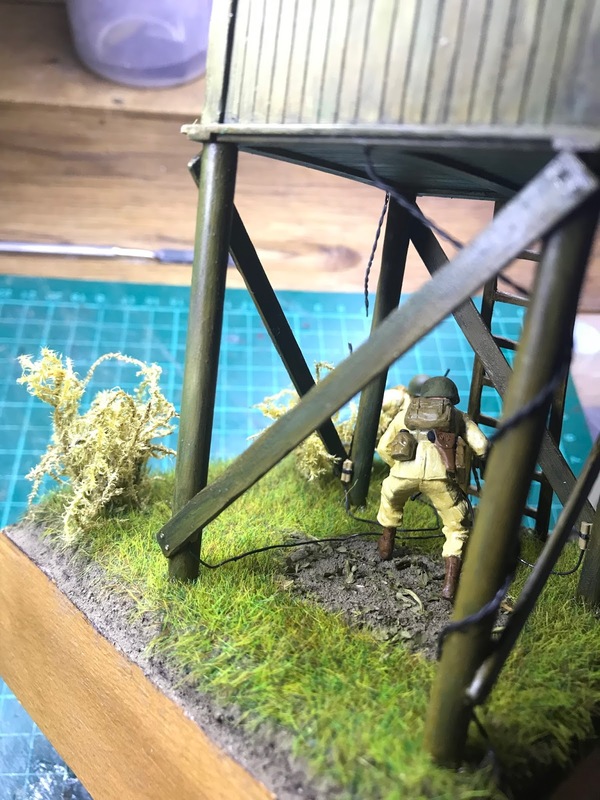 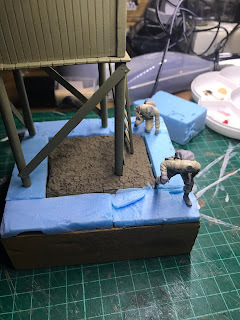 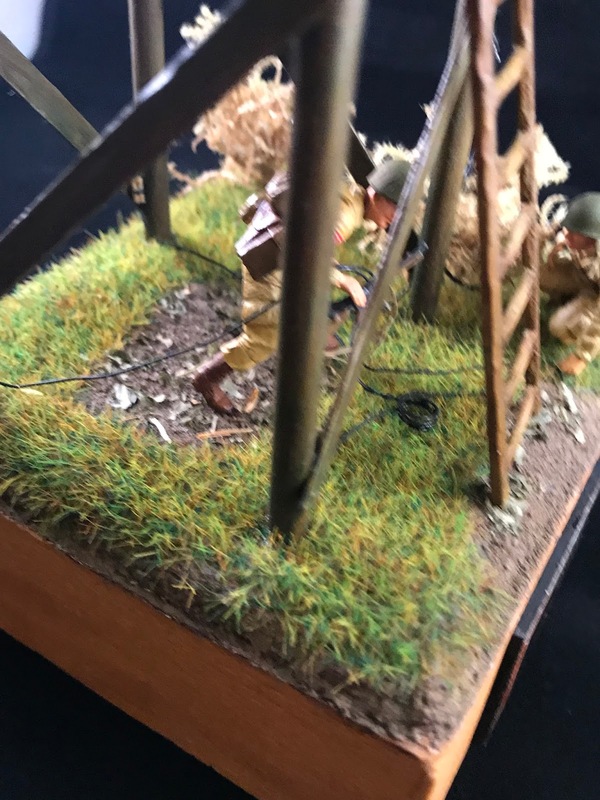 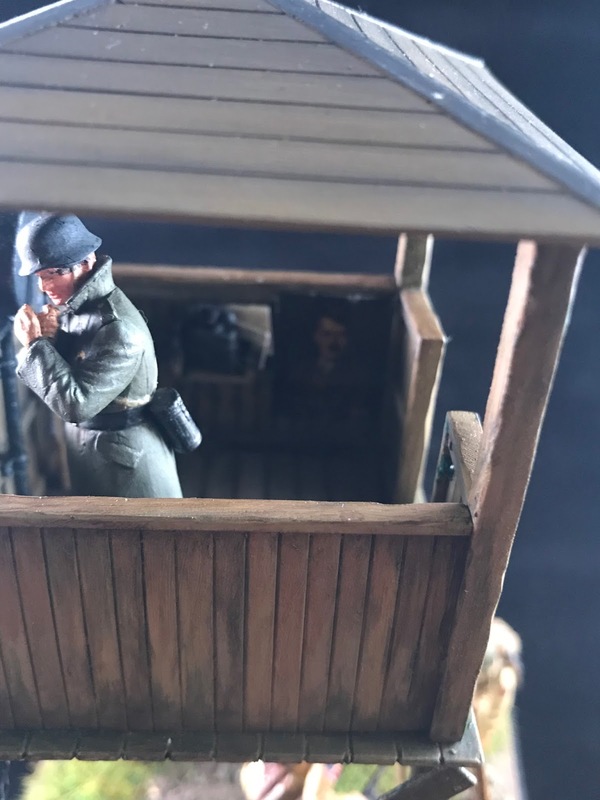 Wires from the explosives were then fed through the structure into one of the figures hands and the whole model was given a final check over before fitting the roof to the watch tower. 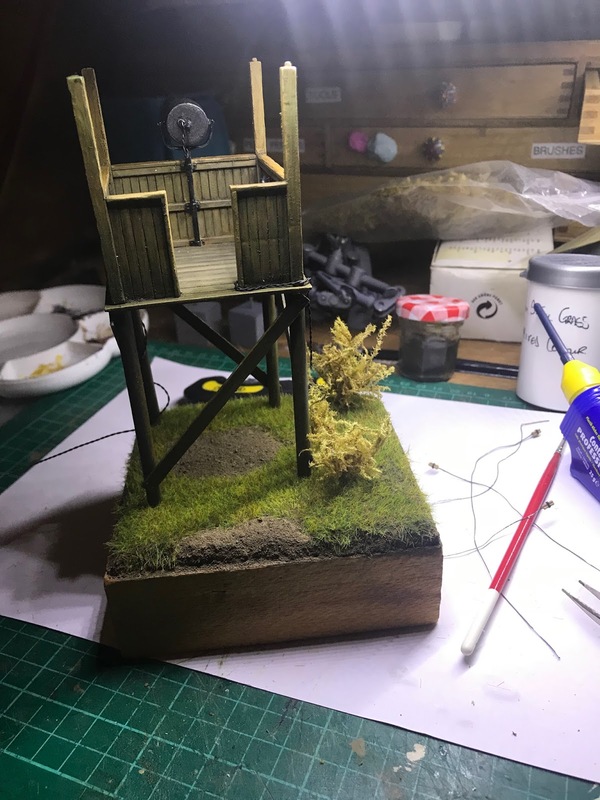 This was a really good project to do and provided me with a simple return to model making after an extended break due to work commitments. 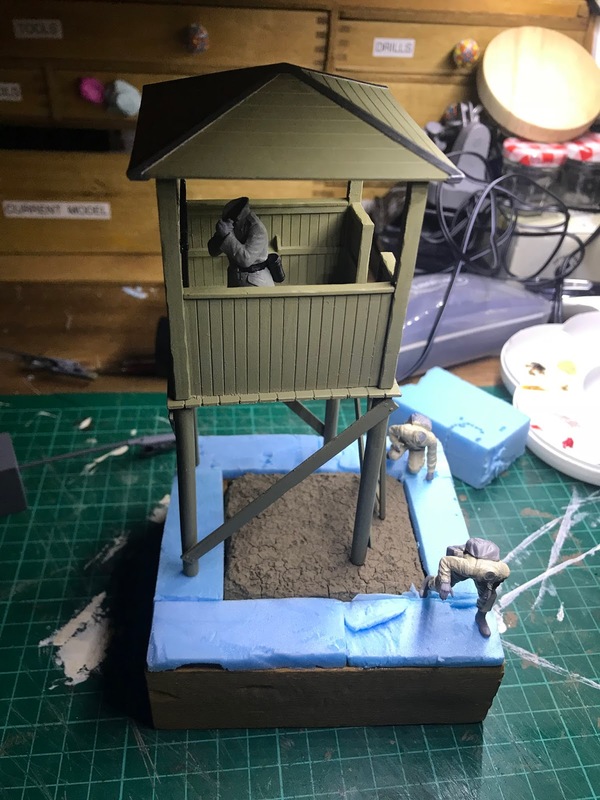 It was a project that on the face of it sounded completely boring but with a little imagination I think it has really come together to make an interesting diorama. 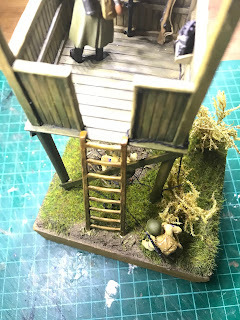 I've placed the finished shots below and as always welcome your comments.